One-pan meals are simple, quick and make cleaning up a breeze. 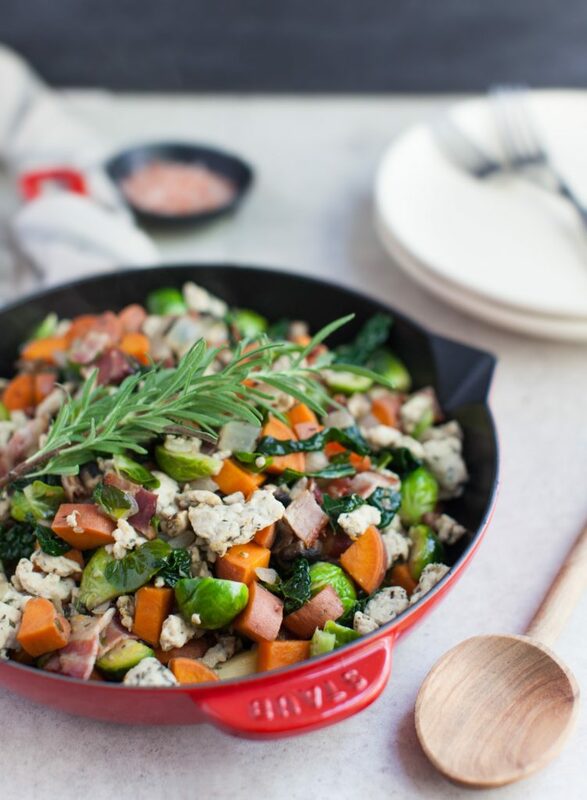 This Kale & Sweet Potato Turkey Skillet is the perfect dinner for busy weeknights. Aside from some prepping and chopping of vegetables, there’s not much work involved and dinner will be on the table in no time! 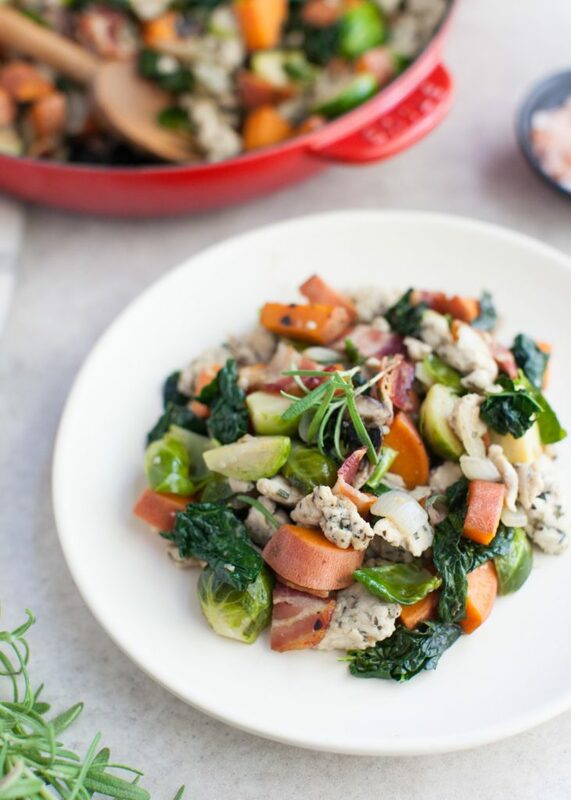 This recipe is packed with seasonal harvest vegetables, lean protein, healthy fats and fall flavor. It’s gluten-free, paleo, Whole30, and AIP-friendly for all of those autoimmune warriors out there. 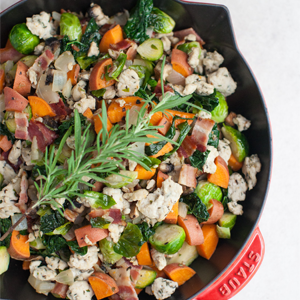 This skillet is a delicious and satisfying meal on its own and also makes a great side dish. Try it stuffed into baked winter squash, rolled into a grain-free tortilla or topped with a poached pastured egg. It’s a great savory breakfast alternative and reheats nicely for leftovers. Whatever you decide, this recipe is sure to become a staple for your weekly meal plan rotation! Place bacon onto room temperature cast-iron skillet and place on the stovetop. Cook over medium heat until crisp, flipping once to allow it to cook evenly. Transfer bacon to a paper-towel lined plate and set aside. Leave bacon grease in the skillet and turn heat up to medium-high. Season ground turkey with dried thyme and ½ tsp of salt. Add to skillet and saute until cooked through, breaking up gently with a spatula. Remove ground turkey from the skillet and transfer to a bowl. Set aside. Grease the skillet with avocado oil and turn heat back down to medium. Add onion and saute for 2-3 minutes. Add in sweet potato, brussel sprouts and garlic. Continue to cook for about 5 minutes or until veggies are softened. Stir in lacinato kale, bone broth and remaining spices. Cook for a minute or two, until kale has wilted and broth has evaporated slightly. Chop bacon into small pieces and add to skillet along with ground turkey. Turn off heat, salt to taste and serve.